What have I learned in the last 6.5 months? I don’t know that I’ve learned a lot, but I have experienced enough to fill a book. For me, pregnancy is a joy. My biggest complaint is that sometimes there’s a lot of pressure on my pelvis. Don’t get me wrong, it’s pretty uncomfortable and has even resulted in shouts of agony as I try to turn over in bed. But, in the grand scheme of things I won’t complain. I’m healthy. My baby is healthy. Everything is on track and normal. My body has adjusted well to the weight gain and effects of pregnancy. No visible stretch marks, although there are still many weeks to go! My “normal” life has basically been unaffected by pregnancy. My job hasn’t suffered. My friendships haven’t suffered. And my relationship with my husband has only gotten better. And Wrigley still likes posing for pictures. I told you I was getting tired of being in these pictures by myself. I didn't even have to recruit this little guy. He willingly joined me while the paparazzi did his thing. Why am I so dressed up? Remember that ginormous work event I had coming up? It was on May 11. You can check out our press release. I know, the date of the picture says May 5. That's the date I was twenty-six weeks. The picture was taken on the night of May 11. 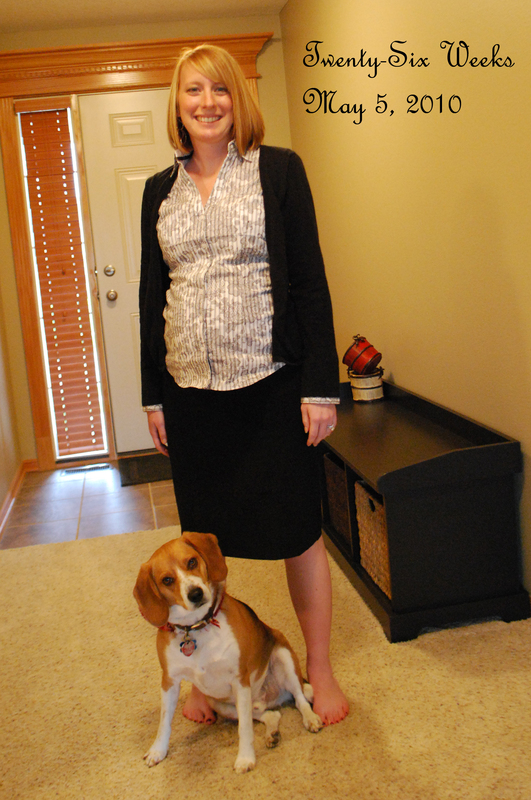 My grand opening outfit: Motherhood maternity skirt, which I love and wear frequently. It's comfortable and I'm a skirt girl at heart.Express long-sleeve flowered shirt. I bought this before I knew I was pregnant. I took the price tags off this very morning. It turns out this will probably be the only wear until next year. Baby Leger barely fit into this thing. I joked with Bryan that I'd probably pop buttons during the keynote speech. (I didn't and probably have a few more inches until I would.) Gap sweater that made the shirt look not so obviously non-maternity. I think I'm still catching up on the sleep that I felt like I wasn't getting before the event. I didn't mess with my bedtime, but the energy exerted during the days and nights was much more than a typical work week. Baby Leger was a trooper and didn't give me any grief. I supplemented his hectic week by providing him ample opportunities to steal food from me. We may have been busy, but we made sure we had food! I know this picture is blurry and I look funny. I didn’t know the photographer was messing with the settings. And I was on the verge of yawning. I told you this was the end of my long day. I was literally fighting back the yawn. In the next series of pictures, I am not fighting it back. But, we won’t share those with the internet worlds. This entry was posted in Pregnancy, Second Trimester and tagged Pregnancy, Second Trimester by Kyley Leger. Bookmark the permalink. What a great post… Congratulations on your pregnancy.